1. Skate at your own risk. Know your ability and skate accordingly. 2. All persons entering the rink are deemed to have agreed to indemnify, defend and save harmless the Borough of Avon and Outdoor Ice ink Partners, LLC, their officers, employees, agents and volunteers for, from and against any accident, injury, including death, and/or loss of property or damage thereto sustained as a result of using the rink. 3. Skate Attendants are provided for your safety. Their instructions must be obeyed at all times. Failure to adhere to Skating Attendant instructions may result in the loss of your skating privileges. 4. Skates must be worn on the ice surface at all times. Skate tags must be worn and visible at all times on the ice. 5. Skates should be worn only in areas covered by protective matting. 6. Equipment, obstacles and other materials may not be brought onto the ice surface. 7. No glass, radios or pets are permitted in and around the skating area. 8. Eating, drinking, littering, cell phone usage and texting are not permitted while on the ice surface. 9. No cameras, handbags, long coats, scarves, backpacks, Ipods or headphones may be taken onto the ice. 10. No racing, speed skating, jumping, backwards skating or weaving across traffic is allowed during public sessions. 11. No chipping, throwing or spraying ice. 12. No more than two skaters may join hands while skating. No chain skating. 13. Do not sit on, hang over or leave articles on the sideboards. 14. Do not congregate near the entry/exit points to the ice surface. 15. Skaters must leave the ice promptly at the end of every public session. 16. In the event of injury to yourself or another, notify a rink attendant immediately. In case of emergency call 9-1-1. 17. No hockey playing in the areas adjacent to the rink. 18. All organized events must have written permission from the Department of Recreation and appropriate permits. 19. No skating or trespassing when the park is closed. 20. The Borough of Avon requires a parent or guardian accompany children under the age of 12. No children under 3 allowed on ice surface. Do not carry babies while skating. 21. The Borough of Avon reserves the right to close the rink at any time. Rink will be closed for inclement weather, rain, ice or snow. 22. The Borough of Avon reserves the right to expel anyone from the park for a violation of the rules. Violation of these rules may result in permanent revocation of skating privileges. 23. Admittance to the rink shall be limited to the established maximum capabilities. 2. All persons entering the rink are deemed to have agreed to indemnify, defend and save harmless the Borough of Avon and Outdoor Ice Rink Partners, LLC, their officers, employees, agents and volunteers for, from and against any accident, injury, including death, and/or loss of property or damage thereto sustained as a result of using the rink. 4. Skates must be worn on the ice surface at all times. Skate badges must be worn and visible at all times on the ice. 5. All players are required to wear skates, helmets, kneepads or shin guards and elbow pads during games. All equipment must be worn to manufacturer’s specifications. 7. No body checking or intentional contact with other players. 8. No foul or abusive language and no fighting or rough play. 9. Additional obstacles and other materials may not be used on the rink. 10. In the event of injury to yourself or another, call 9-1-1. 11. No hockey playing in the areas adjacent to the rink. 12. All organized events shall have written permission from the Department of Recreation and appropriate permits. 13. No skating or trespassing when the park is closed. 14. The Borough of Avon requires a parent or guardian accompany children under the age of 12. No children under the age of 3 allowed on ice surface. 15. 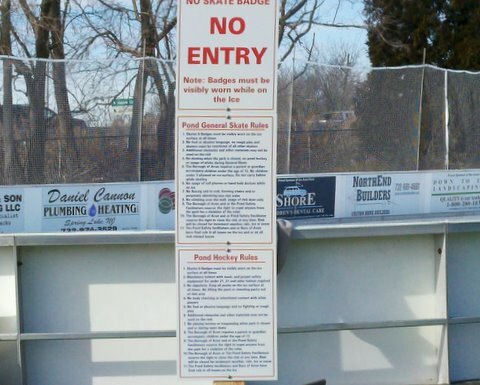 The Borough of Avon reserves the right to close the rink at any time. Rink will be closed for inclement weather, rain, ice or snow. 16. The Borough of Avon reserves the right to expel anyone from the rink for a violation of the rules. Violation of these rules may result in permanent revocation of skating privileges. 17. Admittance to the rink shall be limited to the established maximum capabilities.